As the name above suggests, the structure ( your home) is configured by zones. The best way to implement HVAC zones in a structure is to zone areas of that structure in which each zone or area of the structure are separated by 4 walls and a door. The purpose of HVAC zoning is to put conditioned air where it is needed or wanted and little to none where it is not needed or wanted. HVAC zoning sounds simple, but the problems can become profound when trying to control small areas of a structure with one larger HVAC system that was designed to cool the entire area of a structure. Realize when it comes to cooling (air conditioning) the air circulation needs for 1 ton of air conditioning is 400 CFM of air. Not too bad if you have a small 1 ton air conditioner. Many times homes have 4 ton AC machines and in some cases 5 ton Air Conditioners. If you are only wanting to cool a small portion of your home with a 5 ton zoned AC, that will probably not work like you think it will... because you are trying to defeat the purpose of the 5 ton AC machine. 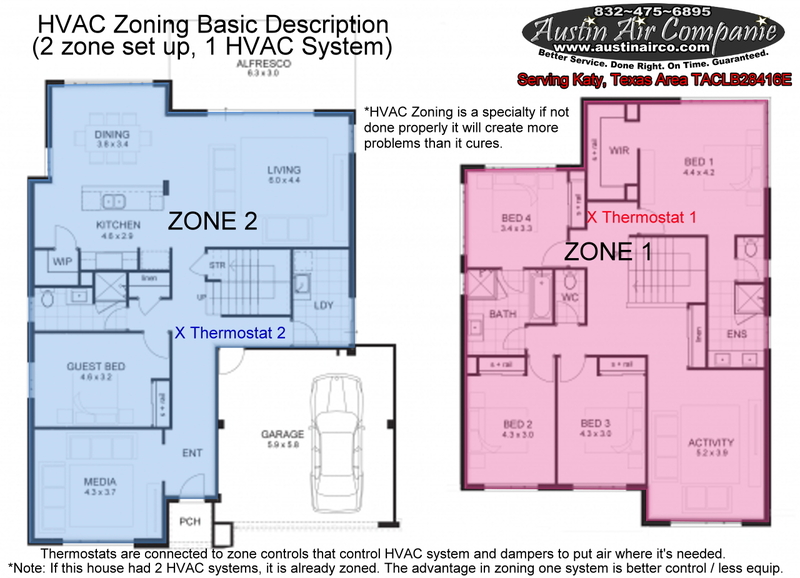 Austin Air Companie provides HVAC zoning services in Katy, TX and the surrounding areas. Say that you are having a dinner party at 6pm on a summer evening. Chances are that your dining room is going to be quite hot, as the expected heat of the night is amplified by the body heat of your guests in the room. You want to be able to keep them cool and comfortable, but you don’t want to waste energy cooling the unoccupied office as much as you must the dining room. This is precisely the type of scenario in which the true benefits of HVAC zoning are evident. With a zone control system in Katy, TX, you can divert conditioned air to the places where you need it the most. By maintaining more moderate temperatures in empty bedrooms throughout the day, then cooling them down shortly before bed, for instance, you can cut down on the amount of energy that you use when heating and cooling your home. Not only will this result in lower energy bills, but this type of usage can also help to limit unnecessary wear and tear on the system. Plus, you won’t have to listen to anyone argue about the temperature settings at the thermostat anymore. When different zones can be controlled independently of one another, everyone can live comfortably. 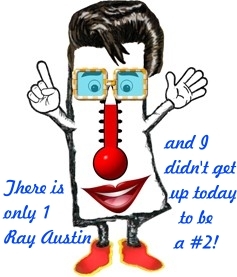 To see if your home is a suitable candidate for a HVAC zone control system in Katy, TX, just contact Ray Austin at (832) 475–6895 to schedule your in home consultation. Salesmen and manufacturer’s of junk, improper design, improper application ( meaning a zone system should not have been installed in the first place.) You must realize a HVAC zone system isn’t necessary for every home. It is a tool in the tool bag, but only for the right set of circumstances. This can only be determined in person at your home to see if the structure is accomodating or not and to determine what your comfort goals are, the equipment the HVAC zone system will be controlling and so on. Design should be elegant with an HVAC zone system, not haphazard. The whole reason you should be looking at this solution is to solve a comfort problem, not create new ones. If you use inferior products for the sake of cutting cost you’re not going to solve the problem for long if at all, typically measured in a few short years for low end options is often times what I see in HVAC zone systems installed by builders. It’s not worth doing in my opinion if that is your goal. I would rather design a HVAC zoned system that will work and work well with little to any fuss at all. 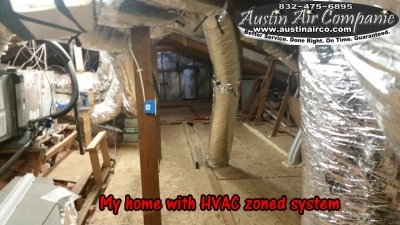 I have a HVAC zone system at my own home on a single level home, but there can be hurdles for this kind of layout as it is not the norm to have a HVAC zoned system for a single level home. The other less discussed part of this is the sum of parts that make up the system any system whether it be the HVAC system itself or controls that control it down to the design of the duct system that delivers the conditioned air (either cooling or heating). Everything that makes up your HVAC system will determine largely how well or how poorly it will perform, especially attached to a HVAC zone controlled system. 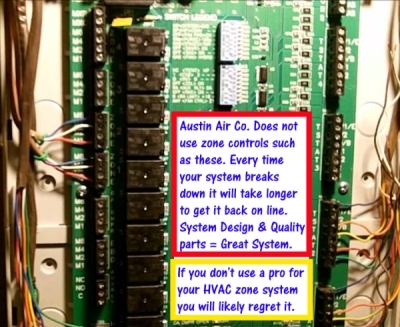 HVAC Zone Systems are not a miracle cure for an otherwise ailing HVAC system. Maintenance is another factor. If a HVAC zone system is designed to have ’breakable’ parts or parts that wear out, well those are hidden costs on cheaper systems. The parts are cheaper and the parts will break and if you don’t have a good repair man are you going to fix it? 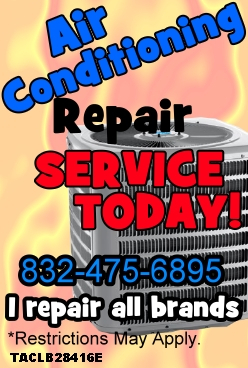 AC systems are notorious for breaking down at the worst possible moment. You have a problem now, so why would you want another solution that is prone to breaking down? This doesn’t mean an HVAC zone system is any more prone to breaking down. Remember the best HVAC system is the sum of all the parts of that system. If I wasn’t a professional in this area, what could I really say about it? There is knowledge in experience. Knowledge alone, doesn’t solve much. 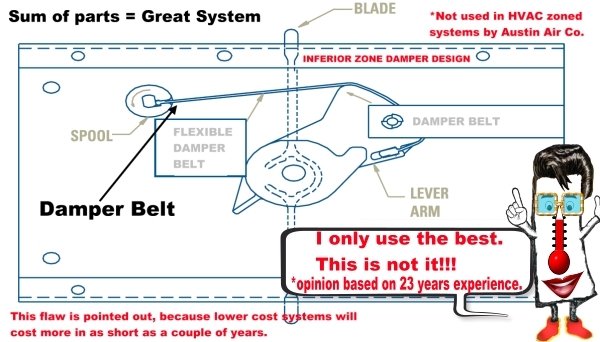 The silly part about this example that I show you here the manufacturer actually says this damper belt design is the better design. So if a salesman shows you a brochure with this kind of stuff laid out you will probably get duped. It’s either that or your home builder installed it. Basically how this damper design works (shown in picture above) is the belt has a rubber clip on each ends of the belt. One side of the belt the clip slides into the spool the other side slides into lever arm. The spool is attached to a motor as the motor spins counter clock wise it tightens the belt by wrapping around spool and pulling lever arm and thus opening damper. It does the opposite to close the damper. Typically the belt fails when either end of the clip of the belt breaks. There is typically a spring actuator that is attached to lever arm of the damper that assists in closing the damper and keeping tension on the belt. The dampers get quite a good work out in a HVAC zone system so this is why I only use quality parts and good design practices in any HVAC zone system that I install. 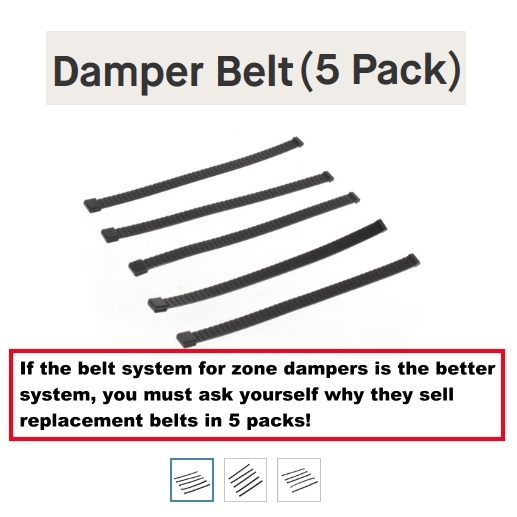 So how bad could replacing the belt be? They sell the belts in packs of 5. LOL. They know you will need more than just one. I tell you this to show you the trickery often involved in lower up front cost options and solid reasons why I don’t offer these as solutions. This is experience talking. If you are still interested in a HVAC zone system for your home or at least getting an honest answer if this could solve your Cooling and Heating problems ’the right way’ for your home I will provide you with an honest answer. Don’t forget, a HVAC zoned system can work. I have one installed on my own home in Katy, Texas. HVAC zoned systems done properly with the right quality parts, proper design for intended structure and within the right application can achieve greater efficiency, better comfort and less wear and tear on your HVAC system. I hope that what I have shown on this page gives you the insight you need to make an some what more informed decision on a very complicated and specialty oriented feature for home comfort solutions. If you are in the Katy, Texas area you can schedule your in home consultation with Ray Austin, owner and operator of Austin Air Companie – call (832) 475–6895 to schedule.